Anyone who knows me even marginally well knows that I love food that’s bad for me (particularly of the limited edition variety) and monsters of any kind. I’d argue that sharks are the best kind of monster. They’re powerful, they ride the line between beauty and terror, and they’re deeply misunderstood. For me, that’s the monster trifecta. I love sharks. I love movies about sharks. And last but not least, I love Shark Week. Say what you will about Shark Week and it’s use of sensationalized stories (or even purely fictitious ones) but I’m a big fan of the programming. I find documentaries about sharks deeply fascinating. Their blend of soothing underwater footage with sudden bursts of intense violence and ferocity. Kinda like an old Italian giallo film but you know, about giant sharks. 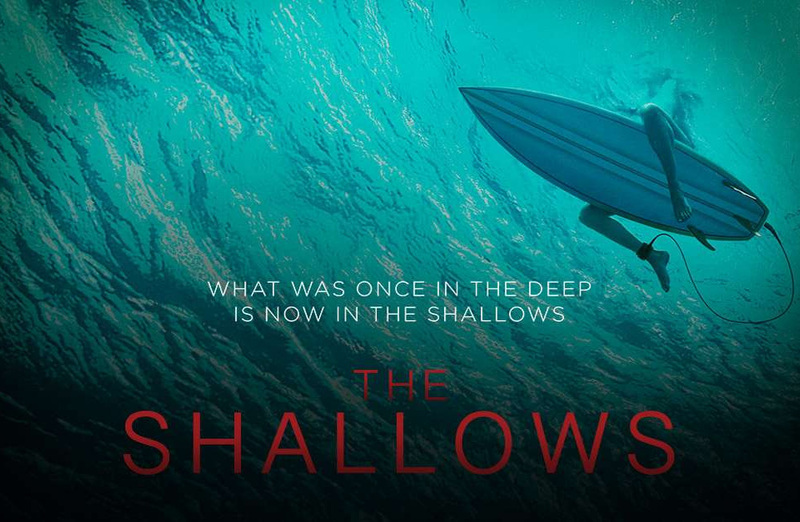 This is going to be a great summer of shark afficianados, as not only do we have Shark Week this year and these Shark Week goodies, but we’ve got a new movie coming out timed for release during Shark Week, The Shallows from Jaume Collet-Serra (House of Wax, Orphan) starring Blake Lively. But I’mean digressing a bit. 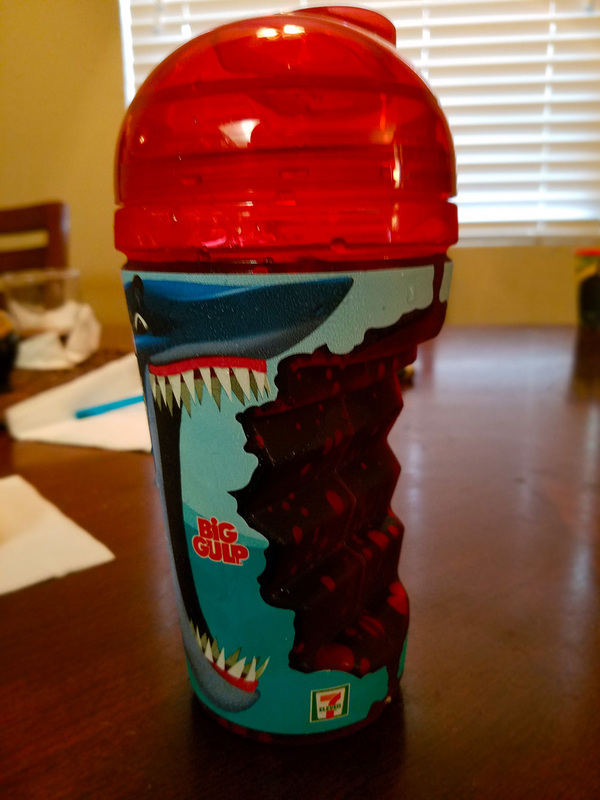 When it was revealed to me that 7-11 would be partnering with Discovery Shark Week to produce goodies and treats to promote one of my favorite annual television traditions, I was ecstatic. I’m a little late to this party, as it looks like this announcement was made a while back, but I was able to trek into a nearby 7-11 and go on a miniature shark adventure. A miniature shark adventure with doughnuts. 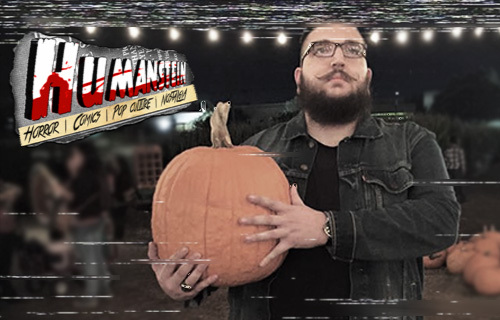 As there always is with these kinds of things, there was a little bit of legwork to be done before I was able to find a 7-11 that was carrying the promotion in my area. I found out about this promotion in the afternoon yesterday, and if there’s one truism in life you can hold to, it’s that donuts aren’t as good at 3 in the afternoon as they are in the morning. So I made the decision that I’d put off the hunt until this morning. 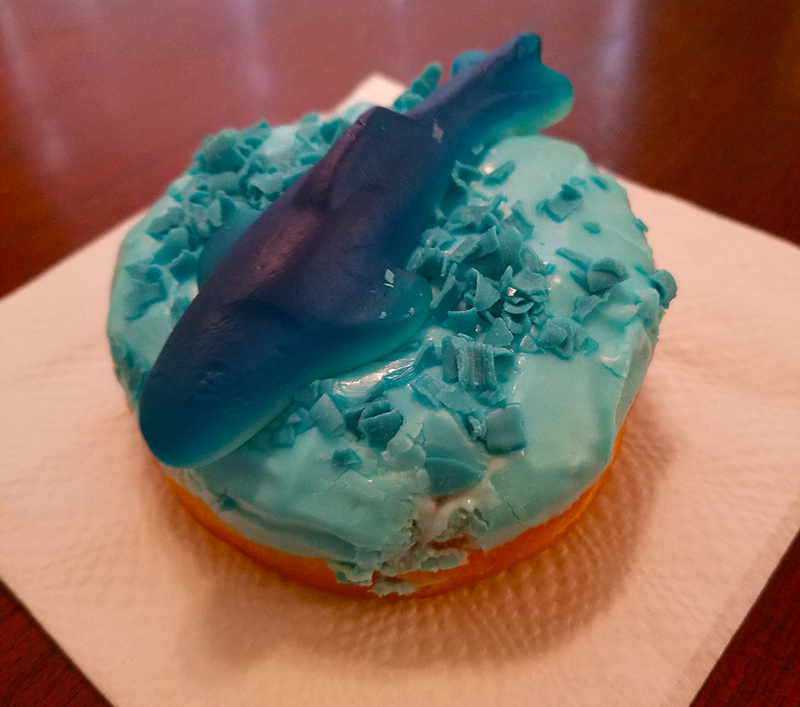 I called four or five different stores before I was able to find one carrying the Big Deal of this promotion, the Shark Week doughnut. Once I’d found it, the woman I spoke with graciously agreed to set two aside for me on the condition that I make it in soon. Not a problem, 7-11 lady, not a problem. When I reached the 7-11 that promised to make my shark doughnut dreams come true, I was greeted by some pretty snazzy window clings advertising the promotion. I wasn’t able to snap a picture of them due to my excitement about this doughnut. I get very excited about doughnuts, even regular ones, so a special shark doughnut got my dander up pretty high. I’m probably going to see if they’ll let me have those window clings when the promotion is done. Shot in the dark, but if I can get ’em, I want ’em. Once inside the store, there was a wonderful display of these Shark Bite cups and adorable Shark Straws. They weren’t the goal, but they were purchased. I went with this one. I’m ashamed to say it almost, but I will definitely be back for the others. They’re painfully cute and I am always on the lookout for goofy glassware and beverage accessories. They retail for $1.49 a piece, so they’re not the most cost prohibitive shark collectible to blow some money on. Take a bite out of Shark Week. 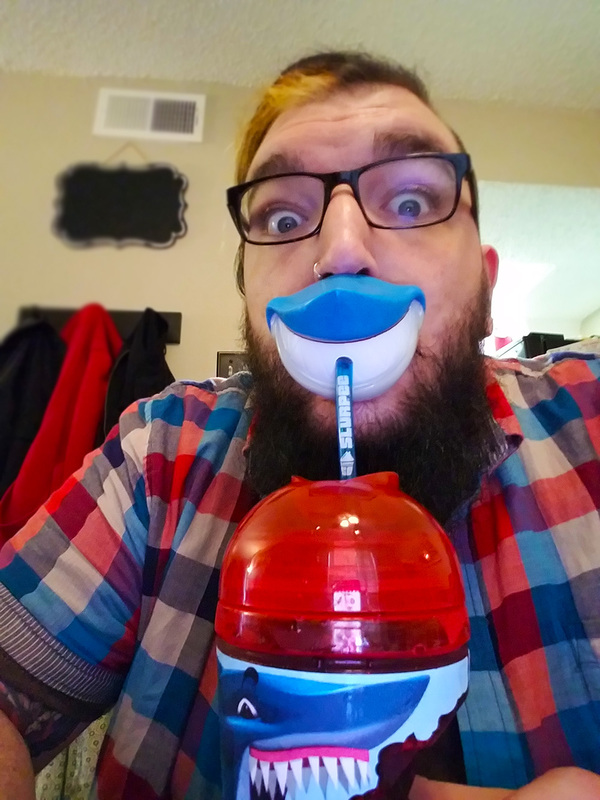 The Shark Bite cups are an absolutely killer promotional item. They’re on theme, have fun graphics wrapped around them, and most importantly there’s a giant shark bite out of the side. 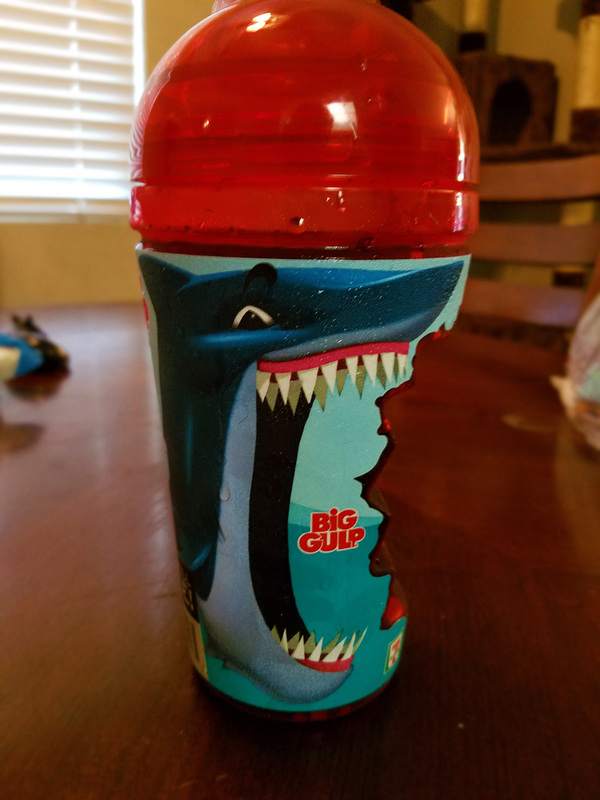 Normally I wouldn’t be a fan of anything that reduces the amount of sugar water I’m able to imbibe without getting up from my chair, but I’ll make an exception for a kitschy shark bite. As an added bonus, the first fill using the collectible Shark Bite cup is free, so you’ll feel a little less guilty buying a $5 shark cup. I personally just went with my perennial favorite, Dr. Pepper as it was just a wee bit too early in the morning for me to consider a Slurpee. The graphic on the front of the Slurpee machine is a lenticular one, so its got a cool shimmery swimming shark effect. They’ve rebranded my personal favorite Slurpee flavor, Blue Raspberry to be the Shark Week Slurpee, and I’m more than okay with that. 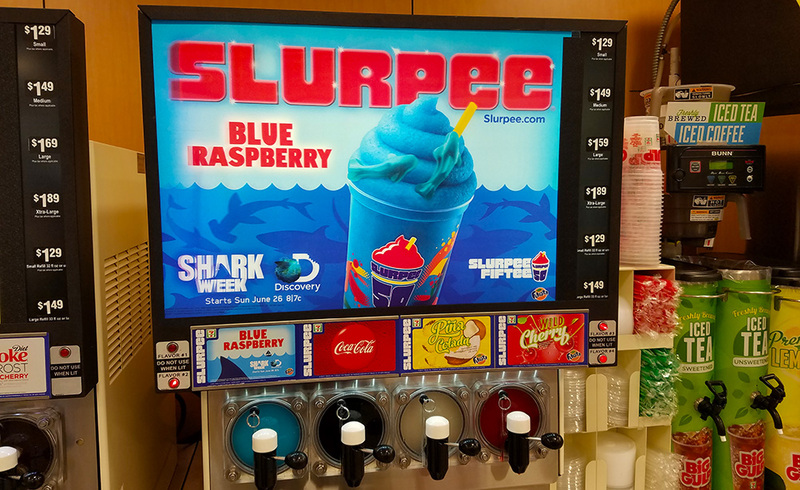 Personally, I’d recommend trying to splash a little red into that blue Slurpee in order to get the real shark bite experience in frozen sugar water form. Sorry for subjecting you to my face. 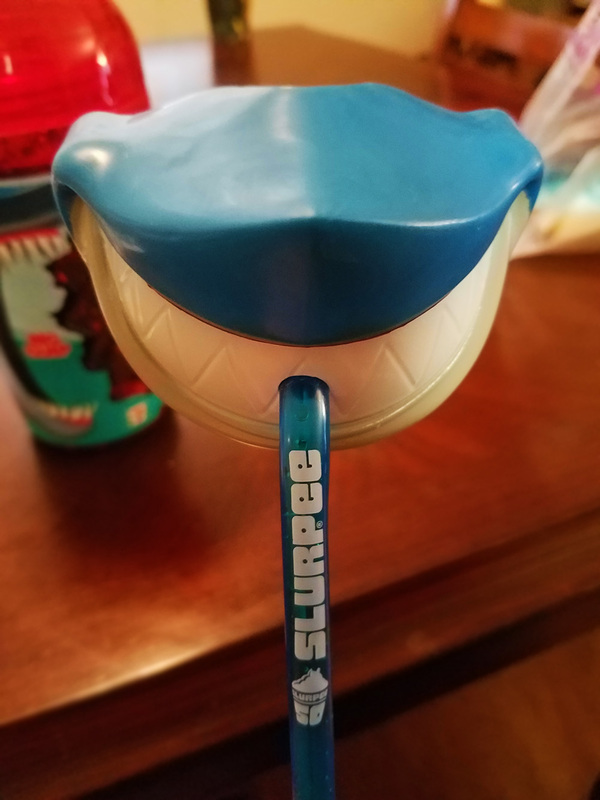 Paired together the Shark Bite cup and the Shark Straw are a force of adorableness that I cannot overstate. It feels about as summery as it gets, and most importantly it just feels plain fun. Highly recommend picking these items up, especially if you’ve got a kid at home you can get super pumped about Shark Week and sharks in general via the use of fun plastic drinkware. Not pictured are the two I bought. 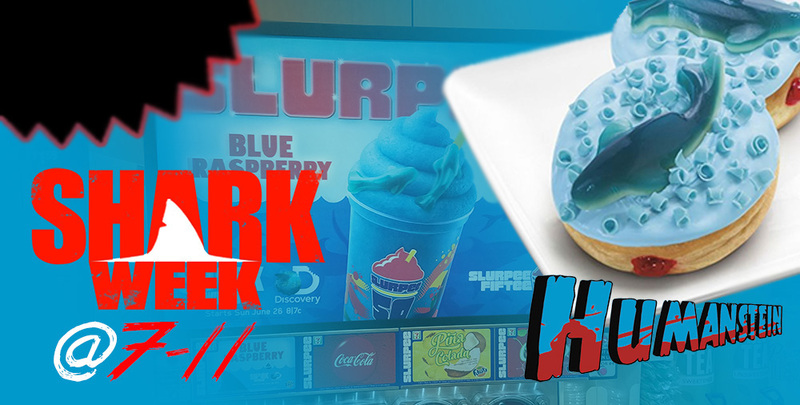 As fun as the cups and straws are, the star of the show though for me is definitely the Shark Week Doughnut. It touts itself as being Blue Raspbery Slurpee flavor, so I was honestly kind of expecting it to be sort of sickly sweet and overpowering. Thankfully this isn’t the case. The devil is in the details with this doughnut, and it’s now secured it’s place in my all-time great food tie-ins due to the level of care put into this goofy $1.49 pastry. The blue of the frosting is the perfect Shark Week blue, a nice nod to the ocean and their apex predator. What seals the deal on this for me is the frosting crumbles on top that definitely give you a “churning water” vibe and the inclusion of a gummy shark on top is absolutely killer. As far as taste is concerned the base of the doughnut is your run of the mill lightly sweet pastry, and while the flavor of the doughnut frosting is indeed Blue Raspberry, but it is a mellow, not overly sweet nor overly sour flavor. Pretty gory for a doughnut right? I love it. The softness and almost gentle nature of the doughnut itself is nicely punctuated by the (regular) raspberry filling that was both a pleasant surprise and an additional nice little nod to both the Shark Week color scheme and the blood-in-the-water visual that permeates Discovery Shark Week. Overall the flavor is on par or better than your average doughnut shop doughnut, which I’m not sure I was expecting out of a doughnut from a gas station. Very pleasantly surprised with this doughnut. Not only is it a stellar promotional tie in, it’s actually a damn good doughnut. 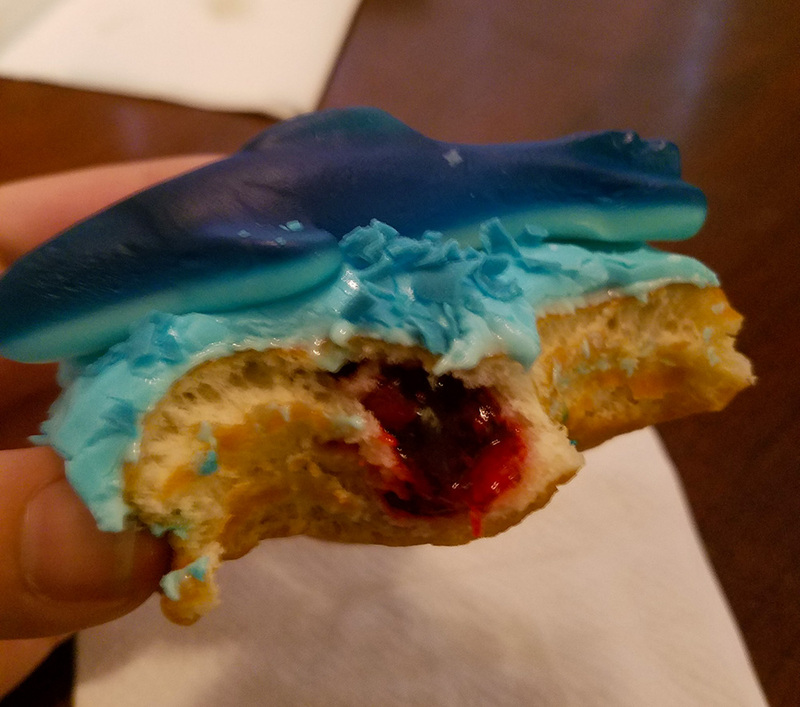 One note is that I did try a bite of the doughnut with the gummy shark and I’d advise against it. My personal recommendation would be to pull the gummy shark off and save it for an after-doughnut-treat. The gummy texture is perfect for what it is, but paired with the ultra soft pastry and the sweet enough as is icing, it was a bit overwhelming both texture and flavor wise. There’s additionally a traditional ring doughnut available, but my store didn’t have it so I unfortunately can’t vouch for it one way or the other. Going off the level of enjoyment I experienced with this one, it’s probably pretty good but I’d definitely advise picking up the more elaborate one if available. I can’t overstate how nicely the textures and flavors of the frosting and pastry played off the fun and fresh raspberry filling. All in all, I’d call 7-11’s partnership with Discovery Shark Week a resounding success and advise my readers to keep an eye peeled for those Shark Week window clings when they’re driving past the local 7-11. Fun and good snacks await inside. Shark Week returns Sunday June 26th at 8/7c, but in the meantime grab some sharky fun over at 7-11.